Edisto Bike & Golf Cart Rentals | Explore Edisto on on wheels! When it comes to experiencing the beauty and adventure of Edisto, a bike ride is hard to beat! Edisto offers trails and bike paths for visitors to explore at their own pace. The five mile Edisto Island bike path offers you a traffic-free paved path to weave your way around our unique beach town. Edisto Beach State Park has several short hiking and biking trails filled with marsh and forest views. Or just wind your way through the quiet neighborhood streets of Edisto Beach enjoying the shops and restaurants along the way. Ready to move around Edisto on four wheels? We offer EZ-GO carts that seat up to 4 people. While golf carts are not allowed to ride on the beach or Palmetto Boulevard, there are many secondary highways and streets to explore! Read more about Edisto Golf Cart Laws (PDF). Also, rented golf carts may not be driven to or stored on properties near the main entrance of the Wyndham Resort. We have a parking lot with charging stations nearby for folks staying in Wyndham who wish to rent a cart. Give us a call for more details! 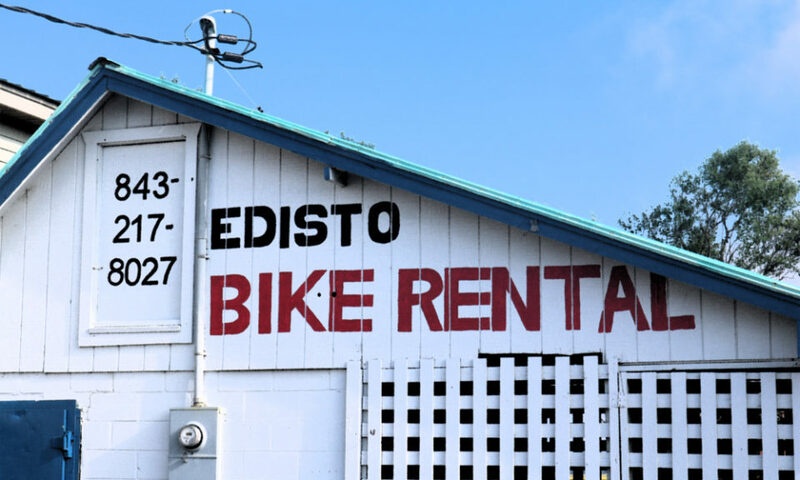 With over 25 years of experience, Edisto Bike Rental (EBR) is ready to help you begin your Edisto adventure. We offer free delivery and pickup on bicycles (adult and children), helmets, baby seats, baskets, kiddie carts, golf carts, and more! Daily, weekly, group, and winter rates available. Located at 3731 Docksite Road, Edisto Island, SC 29438, we are open from 9:00 am until 6:00 pm. Call 843.217.2607 to check daily bike availability or make a golf cart reservation! We have everything you may need to take care of your biking fun while enjoying your vacation on Edisto! FREE pickup and delivery. Call 843.217.2607 to check daily bike availability or make a golf cart reservation! We are next door to Edisto Watersports & Tackle.